This year I designed a tablerunner that you can knit on the 24 days of Advent, every day a little bit. The picture is extra small - it gives you just an idea of what you will knit but (hopefully ;-)) don't spoil the surprise. that's how I knitted the scarf and there I filled the areas between the rows of holes alternately with knit stitches and purl stitches. This year the pattern is 'complete', i.e. not meant to be repeated in height or width. the total length are 482 rows. leave out the same number of rows at the begin and end. Please bear in mind: the size always depends on your gauge and also on the way you knit - I'm always knitting very loosely. (30 x 168 cm are about 12 x 66 inches). Depending on my daily energie I knitted a daily pattern section in 30 - 35 min. (35 x 160 cm are about 14 x 63 inches). Depending on my daily energie I knitted a daily pattern section in 35 - 40 min. (30 x 22 cm are about 12 x 9 inches). I knitted a placemat in barely 2 hours. Du kannst diese Seite auch auf deutsch lesen. (PDF ~50 KB) by using my patterns. Sounds like a really fun project! I would love to participate! I love this idea, and will try to keep up and give it a try, G.
You have open the dance! 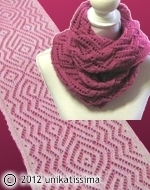 Loving the advent scarf – only frustration is having to wait until lunchtime to get the day’s pattern here in Australia! Thanks a lot for these patterns <3. I wish you a nice Christmas and a Happy New Year 2013.